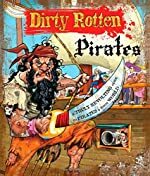 Dirty Rotten Pirates: A Revolting Guide to Pirates and Their World by Moira Butterfield. Review: Do you like pirates? Do you want to learn more about them? Well, in Dirty Rotten Pirates by Moira Butterfield, you learn everything from typical pirates to the pirates you might not have thought existed. Buccaneers to Privateers, these pirates don't joke around; either do your job correctly or your life is in danger. This non-fiction book is phenomenal and has you staying up all night just to finish. In Dirty Rotten Pirates there are pirates from Asia to Europe, and they raided and captured each other. Life was dirty and rotten for the average pirate. Barely a few pirates actually got rich and have a life of wealth. Rules were strict and either you followed them or received punishment. Punishment was brutal, being marooned, shot or worse. There weren't just one type of pirate; there were the proper pirates. But there are more. For example, there are many pirates from Asia, and also Vikings are also pirates. Pirates vary, as there are buccaneers- the typical pirates, and privateers- licensed pirates. A job of a pirate was very dangerous and could endanger the worker. For example, the Gun Master that is, the person who shoots and loads the cannons, had very dangerous job. Being injured was very bad, since germs weren't known at the time, and they didn't clean the tools used to remove limbs. So if the pirate didn't die from the surgery, they probably died from infection. Dirty Rotten Pirates was extremely interesting and kept me hooked every page throughout the book. I was very intrigued and wanted to know more and more about pirates. I learned so much; for example, I learned new famous pirates more than Black Beard. I even learned there were female pirates. This book I would recommend it to boys ages 9-12, since it's about pirates. The information in the book was very impressive and kept me reading. The artwork was very fun, goes with the information, and shows what pirates look like in an entertaining way. I was astonished at how the book showed real pirates living and working, and how descriptive it was. I learned so much about pirates just from one book. Dirty Rotten Pirates is an informational but entertaining book with great description and artwork. I hope you love it as much as I did. Review written by John (6th grade student). We would like to thank Ticktock for providing a copy of Dirty Rotten Pirates: A Revolting Guide to Pirates and Their World for this review. Have you read Dirty Rotten Pirates: A Revolting Guide to Pirates and Their World? How would you rate it?